Summer picnics are here again and ours is never complete without bhel in a bag and chutney sandwiches. Here is a #quick and #easy way to pack both for your next picnic! Bhel is a very popular street food, especially in Pune and Mumbai, India. You are sure to find a bhel cart in and around picnic places like parks, beaches, and old forts with hiking trails. It draws a huge crowd of people , and it is with awe that one watches the ‘bhelwala’ mix each bhel to order! 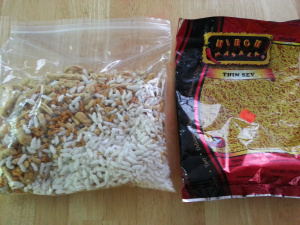 So here in America, I started packing bhel for our summer picnics, with the dry and wet ingredients ready to be mixed on site, and the concept of bhel in a bag was born! 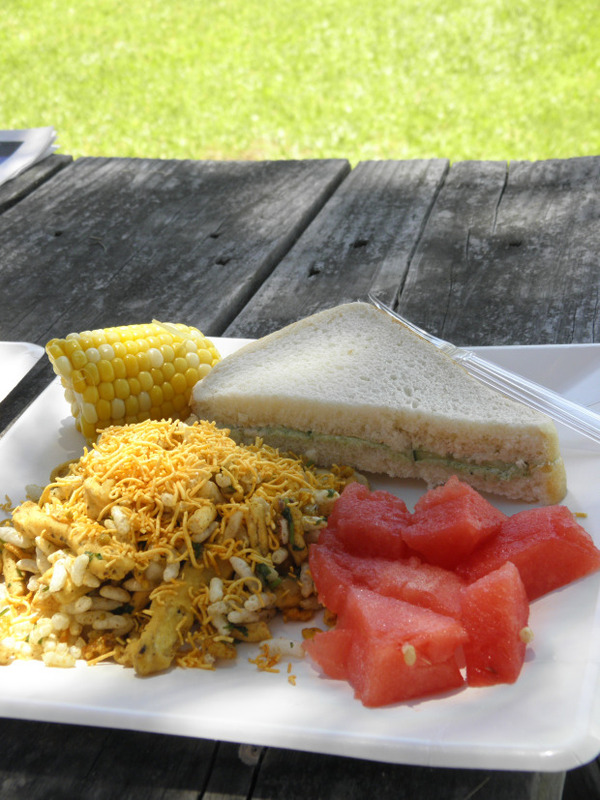 So as soon as the weather got warm this year, we headed off to the harbor islands with our favorite picnic menu – bhel in a bag, chutney and cucumber sandwiches, cut watermelon, and corn on the cob! Loving this picnic Sandhya. Is bhel the stuff they put in bhel puri and pani puri? I remember eating them on the beach in Juhu on a couple of occasions when we’d visited. Loved it. I like the different things in your picnic basket. Chutney and cucumber sounds quite delicious, then the bhel, corn and then the watermelon. Perfect accompaniment on all fronts. Thank you so much for your sweet comments Loretta! Ooooh this is my kinda picnic!! 😀 I can see why! !